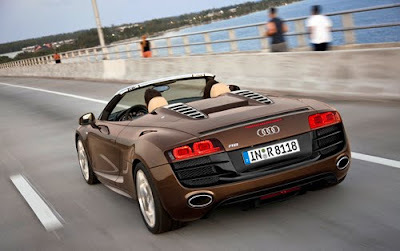 Until now, it's been common knowledge that Audi's drop-top R8 was only available with a 5.2-liter V10 under the hood. Inside Line however, has "set the record straight" today by announcing that Audi will offer a V8 version of the R8 Spyder that should hit showrooms by "early 2011, at the latest." Inside Line also points out that the V8 Spyder should cost roughly $30k less than it's V10 counterpart.